North America’s smallest falcon, the American kestrel, is getting a leg-up in south-central Wisconsin. Four orphaned kestrel chicks were discovered and brought in for rehabilitation, and placed into foster kestrel nests that allowed the chicks to be raised by wild mothers with nestlings their own age. American kestrels are a beloved falcon for their tiny stature, big personality, and beautiful coloring. However, the kestrel population in southern Wisconsin declined 41% between 1966 and 2014, according to Wisconsin Breeding Bird Survey data, and the stark downward trend continues today. This is partly due to loss of their natural nesting sites in trees with cavities. Kestrels now largely rely on man-made nest boxes for nesting habitat, and readily take to them. However, sometimes kestrels will nest in other structures, such as barns. In the case of the orphaned chicks, a barn containing a kestrel nest was torn down and the nest abandoned by the parents. The chicks were recovered, and sent to the Dane County Humane Society’s Wildlife Center for rehabilitation and care. “The barn was demolished on [June 9, 2018], and the chicks came to us shortly after,” explained Stacy Taritas, volunteer for both the Wildlife Center and Madison Audubon Society. The four chicks were placed into an incubator and “fed with tweezers while volunteers wore masks” to avoid the birds from “imprinting on”, or becoming too attached to, their human caregivers. The chicks were approximately 10 days old when they arrived at the Wildlife Center. Serendipitously, Madison Audubon Society, a local organization which focuses on bird conservation and environmental education, and the Central Wisconsin Kestrel Research program based in Stevens Point, had a joint kestrel banding outing scheduled for Friday, June 15 around MAS Goose Pond Sanctuary in Columbia County. This event was part of an ongoing research project involving Janet and Amber Eschenbauch with CWKR, along with Madison Audubon volunteers and members, to retrieve adult kestrels and chicks from nest boxes to band, weigh, and provide feather and toe nail samples from the birds before placing them back into the nest. The bands allow researchers to understand kestrel movement, migration, and nesting territory. The feather and toe nail samples help researchers determine more in-depth information about where the kestrels have been living and who they are related to. Taritas transported the four orphaned chicks from the Wildlife Center to the event, and they were easily integrated into four nests in the wild. Event attendees asked questions about whether the mother notices or objects to the new addition. “The short answer is: kestrels can’t count,” said Janet, who runs the Central Wisconsin Kestrel Research program. “Kestrel mothers don’t know that they have four chicks in the morning and five in the afternoon.” Kestrels typically raise between four and six young, so nests with five or fewer and of the same age as the orphaned chicks were good candidates for receiving an extra nestling. “We also make sure to add only one orphaned chick to any nest so we don’t overburden the foster parents,” added Amber, fellow bander and researcher for CWKR. In a normal year, food is plentiful and the mother can easily feed all of the young, including the added chick. Kestrels eat mice, voles, insects, small snakes, and other small prey items. “We get about 4, 5, 6 orphaned chicks each year,” explained Janet, who said most come to them after an old building is demolished or a tree snag falls down and later a nest with chicks is discovered. Those chicks are either placed into foster nests if they’re young enough, or are raised in a facility and released into a kestrel family group after they’ve learned to fly. 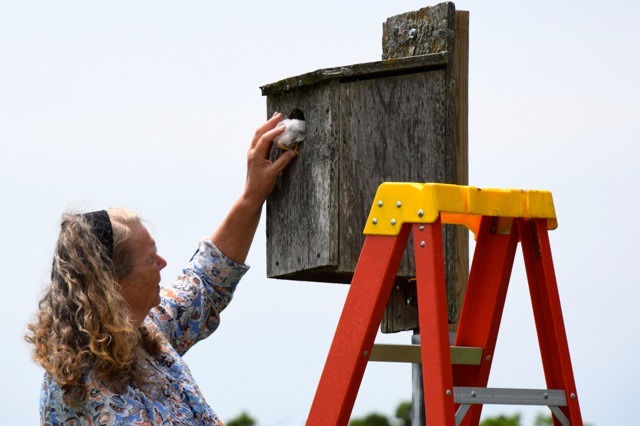 The nest boxes which received the orphaned chicks are enrolled in Madison Audubon’s kestrel nest box monitoring program that involves regular, non-invasive visits by volunteers to monitor nest development. The active nests in the program have a high success rate for raising young kestrels, and a growing number of previously banded kestrels are found as nesting adults each year. Madison Audubon Society, is a non-profit organization based in Madison and serving eight counties in south-central Wisconsin. MAS provides land protection and restoration, environmental education for all ages, and science-based advocacy on behalf of its land and constituents. Visit madisonaudubon.org to learn more. Dane County Humane Society (DCHS) provides refuge, healing and new beginnings to over 9,000 companion animals, exotic species, farm animals and injured or orphaned wild animals every year. DCHS, including the Wildlife Center, is a private, non-profit, open admission shelter accepting all animals that need assistance regardless of age, health status or temperament. DCHS has an adoption guarantee, meaning all healthy or treatable animals can stay at DCHS as long as it takes to find a loving home. 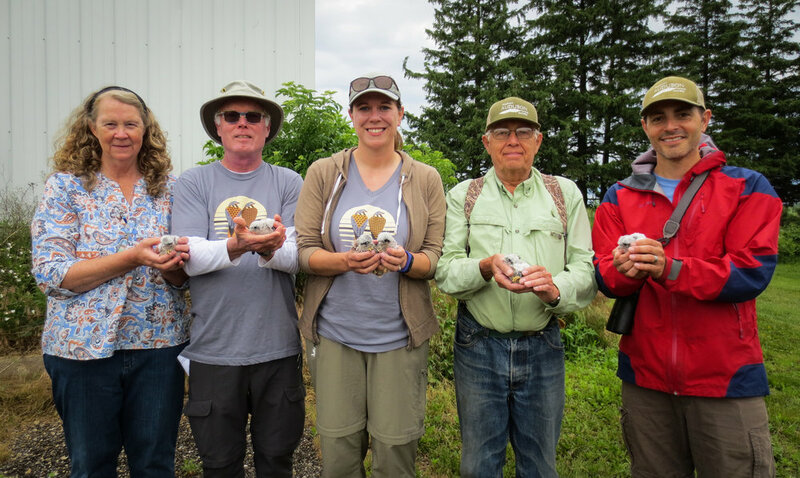 Central Wisconsin Kestrel Research is dedicated to the quest for knowledge about American Kestrels, while providing educational programs to the public. The program is run by Janet and Amber Eschenbauch. Both are UWSP graduates with degrees in Biology.